Erin and Andrew almost didn't have a wedding cake. Not that they didn't want one--Erin was just interested in other desserts--maybe pie, or an assortment of treats. As they planned for the wedding, Erin made many selections for the party that were incredibly unique, from an off-shoulder wedding gown to a Kongming Chinese Sky Lantern release at the reception...but her brother jokingly begged for a traditional cake--Erin mentioned to me that he said "it can't be a wedding without a cake"--so she chose a traditional white tiered cake, and included a cake topper with a quote from their favorite childhood book (Where the Wild Things Are) in honor of his request. In this way, Erin and Andrew's hilltop wedding in the Fredericksburg countryside was full of surprises and special touches that were themed around not only their love, but their family as well. In fact, they had a gorgeous painting that held all the dinner placecards, and one of Erin's brothers painted that, too. Also, guests sipped from these cute little soda straws during the cocktail hour as they watched the sun set. Erin selected florals for the wedding that were very reflective of the wedding's location in the rustic and wild Texas countryside. The men's boutonnieres had both succulents and other hardy plants native to the region. If you haven't visited Fredericksburg before, it is one of those special towns nestled into the hill-country where people love to spend the weekend--You can wander through streets filled with quaint little bakeries, wineries and breweries, toy-shops boasting the skills of the town's german/european heritage, and of course, many restaurants overflowing with German food and good Texas eats. 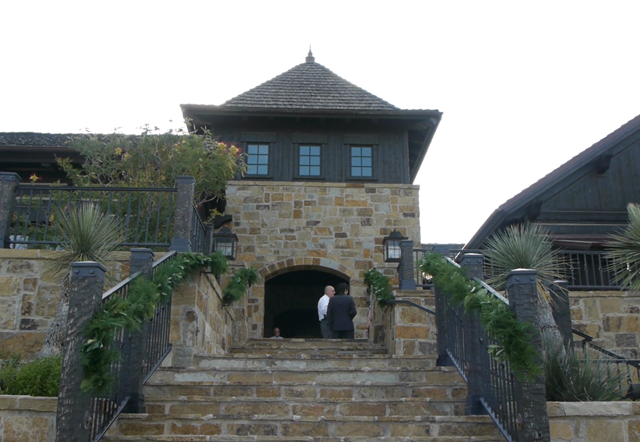 Just before the ceremony, some of Andrew's friends remarked at the beauty of the short drive from the little town to the hills where Boot Ranch resides. The road, filled with twists and turns, ends at the gorgeous hilltop lodge, a perfect party venue with craftsman architecture and a terrace made of natural stone overlooking the hills. Erin and Andrew had a private moment in a hillside garden just before the ceremony. Photographers commonly refer to this as a "first look." We were thrilled to work alongside noted fashion photographer Christianne Taylor at this wedding. She's based in California, but she often returns to her native state of Texas to document special projects. We've worked with her before at Sarah & Colby's ranch estate wedding, and it was delightful to work with her again. 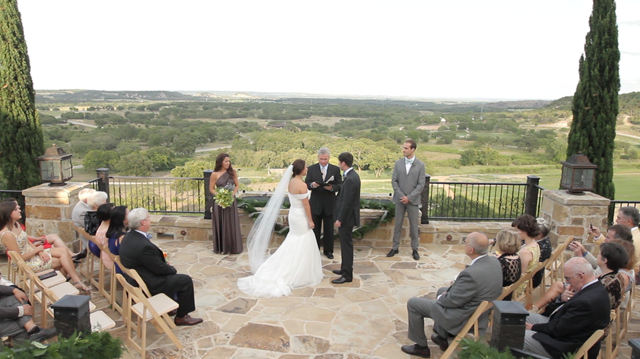 Both Erin and Andrew's fathers gave touching speeches at the wedding, and I look forward to editing their final film. Congratulations to you all!